The 2015-2017 dialogue entitled “The Putin Interviews” transmits central and valuable lessons in History. 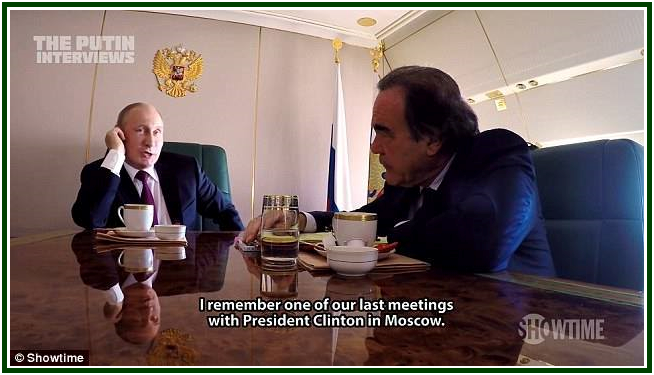 Filmed in Moscow by Oliver Stone and also available as a book , the conversation reveals much of the intercultural approach we need in order to live in peace on the planet. National cultures and specific lines of Karma must be respected: no country can act as the sole Sheriff of the world. The study of original theosophy makes it clear that Russia is a cultural and spiritual bridge between Asia and Western Europe, and should be looked at with care and in depth. From the point of view of human evolution, harmony must be expanded among the main civilizations now existing on Earth. Outward uniformity in politics is not desirable. There is no point therefore in provoking a second Cold War between the two nuclear superpowers, which would only debilitate the efforts against nuclear proliferation. A balance has to be preserved in the way Eastern and Western nations interact. Propaganda war cannot replace facts: Russia is a great country; its cultural, philosophical and spiritual power is immense; by understanding the Russian soul Westerners will be better able to understand Asian cultures, and attain to a deeper view of their own Western Dharma and mission. Perhaps the need for long term cooperation between the United States and Russia was seen in advance during the 19th century by the Eastern Sages who inspired the foundation of the modern theosophical movement. Some students of esoteric philosophy believe it was not a coincidence that the main founders of the movement, in 1875, were born precisely in the USA and Russia, in an apparent anticipation of the dangerous Cold War the world would have to face in the 20th century. The main founder of the theosophical movement was the Russian thinker Helena Blavatsky, and she founded it in New York. In our own century, we have renewed reasons to preserve the inner harmony between Russia and the West. A respectful interaction among nations attracts spiritual energies to the world today. It preempts blind policies based on hatred and fear. The need for mutual respect and cooperation between Russia and Western countries has been self-evident for decades. Both the world peace and the state of the planet depend on each good-willing citizen. For this reason Helena Blavatsky wrote that mankind’s fate is, up to a certain point, in the hands of those theosophists who feel responsible for the future. However, being a theosophist has nothing to do with formal affiliation to one association or the other. A theosophist is a friend of truth. There are members of the theosophical movement who are not theosophists, and theosophists who are not members of the theosophical movement. Blavatsky and her Eastern teachers constantly invited good-willing citizens to feel co-responsible for the common Karma of present civilizations. For those who try to go beyond appearance and dead-letter, the invitation is as valid as ever in the 21st century. Oliver Stone has done a service to mankind in helping pave the way to intercultural dialogue. “The Putin Interviews”, by Oliver Stone, Hot Books, New York, 2017, 277 pages. Also available in video at Showtime: http://www.sho.com/the-putin-interviews. See in our associated websites the article “Slavophilism and Theosophy”. The above words are reproduced from the back cover of the book “The Putin Interviews”. See in our associated websites the 2-minute video “Eisenhower Denounces Military-Industrial Complex”. It is easy to find through the Lists of Texts in Alphabetical Order. On Kissinger and the international order, see in our websites the article “The Birth of the Future”. Click Here to watch the 3m video with Oliver Stone in the YouTube channel of “The Aquarian Theosophist”.